Like animals, plants, fungi and ameobas — but unlike bacteria — hemimastigotes have complex cells with mini-organs called organelles, making them part of the “domain” of organisms called eukaryotes rather than bacteria or archaea. Just a minute here. The new organisms “were found in dirt collected on a whim” on a hike. Why should we assume that they are rare, as opposed to unsought? One can only wonder what new insights we would gain if there were less Darwin in our system and more open-minded exploration. Hmmm. Half a billion years is a long time. Why start by assuming that we even have a common ancestor? : Who decided that that should be our main focus just now when everything else has been a century-long mystery? Opening sentences of the Letter to Nature Almost all eukaryote life forms have now been placed within one of five to eight supra-kingdom-level groups using molecular phylogenetics1–4. The ‘phylum’ Hemimastigophora is probably the most distinctive morphologically defined lineage that still awaits such a phylogenetic assignment. 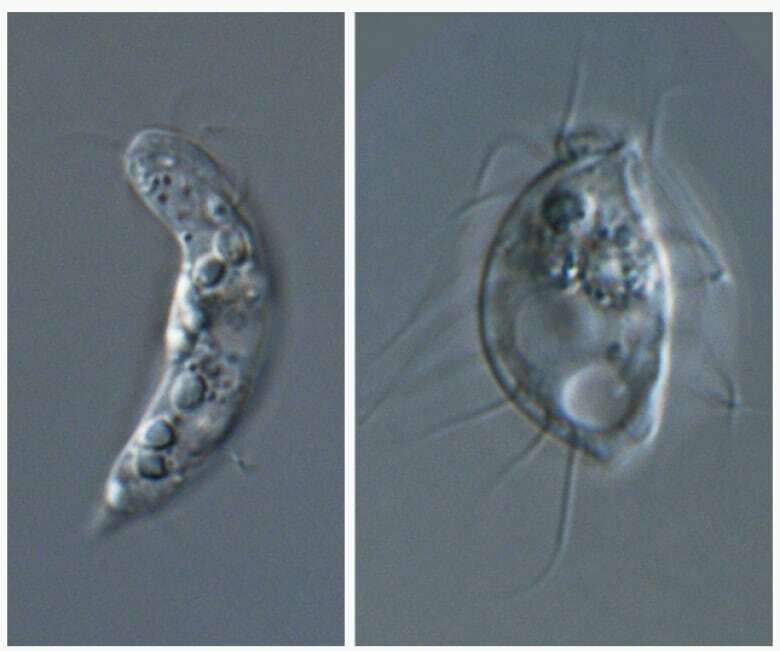 First observed in the nineteenth century, hemimastigotes are free-living predatory protists with two rows of flagella and a unique cell architecture5–7; to our knowledge, no molecular sequence data or cultures are currently available for this group. Here we report phylogenomic analyses based on high-coverage, cultivation-independent transcriptomics that place Hemimastigophora outside of all established eukaryote supergroups. They instead comprise an independent supra-kingdom-level lineage that most likely forms a sister clade to the ‘Diaphoretickes’ half of eukaryote diversity (that is, the ‘stramenopiles, alveolates and Rhizaria’ supergroup (Sar), Archaeplastida and Cryptista, as well as other major groups). The previous ranking of Hemimastigophora as a phylum understates the evolutionary distinctiveness of this group, which has considerable importance for investigations into the deep-level evolutionary history of eukaryotic life—ranging from understanding the origins of fundamental cell systems to placing the root of the tree. We have also established the first culture of a hemimastigote (Hemimastix kukwesjijk sp. nov.), which will facilitate future genomic and cell-biological investigations into eukaryote evolution and the last eukaryotic common ancestor. (open access) More. The story reminds some of us a bit of new findings about viruses. See also: Virus expert highlights the conflict over whether viruses are alive In short, it is an open question. The question relates to the role viruses can play in evolution, among other things. Are they precursors of life, detritus of life, or something in between? Or all three? Keep the file open. The researchers describe hemimastigotes as representing a major new branch on the evolutionary tree—standing above the level of a kingdom. So I guess this would not be “just” another kingdom, but rather would represent a new grouping at an even higher level? The authors’ use of the term “supra-kingdom” implies that but right now everything seems a bit fuzzy. No surprise there. Just a minute here. The new organisms “were found in dirt collected on a whim” on a hike. Why should we assume that they are rare, as opposed to unsought? I think they were referring to discoveries like this being rare, not that organisms like this were necessarily rare. Hemimatigophora appears to lie close to all of these positions on the unrooted tree (Fig 4), and could be our only know representative of one of the most ancient divisions amongst extant eukaryotes. Accordingly, we searched the single-cell transcriptomes for genes that could have arisen during the divergences between supergroups. We found several genes in hemimastigotes that are not known from Diaphoretickes, including those for myosin II—preveiously known from Amorphea, and one subgroup of Discoba—and Golgi protein GCP16 (also know as golgin A7) (previously specific to Amorphea). The presence of such genes in hemimastigotes either pushed back their likely origins to before the last eukaryotic common ancestor (or supports this inference) or—more controversially—could be due to the root of eukaryotes being further from the base of Amorphea than generally supposed—that is, Amorphea and Hemimastigophora being on the same side of the root (shown by the top variant of position c in Fig 4). So, “underestimation of the gene content of ancient eukaryotes,” and “overestimations of the simplicity of their cell biology” has taken place heretofore. IOW, climbing Mount Improbable just became more difficult. How many more difficulties await discovery?